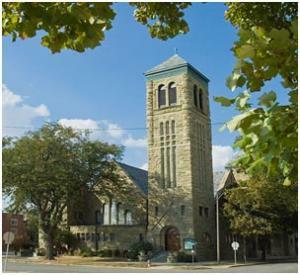 First Presbyterian Church was organized in 1852 and the congregation met in its first permanent building on the southeast corner of Church Street and Prairie Avenue. Its present building was erected on the northwest corner of the same streets in the 1890s. Mosaic floors in the two south entrances are original as are the leaded stained glass windows there. Two wall niches in the southeast entrance contain a bust of the Christ Child and a bronze Celtic cross to symbolize the birth and death of Jesus. 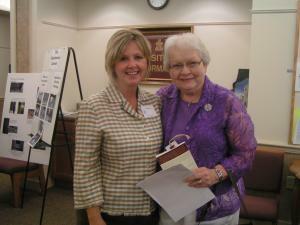 Since the building was dedicated in July, 1892, many renovations and additions have occurred, as described in a booklet, “A Sesquicentennial History,” published in 2002. The present sanctuary is the result of a 1961 renovation, creating the present chancel where a large Celtic cross was mounted, and adding a new Reuter pipe organ on the north wall. A 2006 renovation created a new chapel and gathering room. In 2008 the organ was completely renovated to add new features. In 2005 the congregation approved a major renovation project that included creating a modern chapel where a parlor had existed since 1952. The stained glass windows on the east wall, previously covered, were once again revealed. The round stained glass window previously installed high in the front wall of the old chapel was relocated to the west wall of the new chapel with backlights added. Another creation of the 2006 renovation, the Gathering Room provides an area for fellowship, as well as small meetings and receptions. The Communion table in the center of the chancel is engraved with wheat and grapes, symbolizing the Eucharist as the central act of Christian worship. 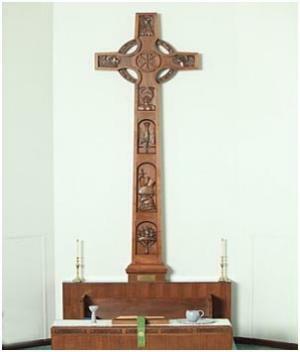 Above it on the front wall is a large Celtic cross (see page 8), a traditional symbol of Presbyterianism. Flanking the cross are two large candles, known as Christ candles, reminding us that Jesus is the Light of the world; one represents His human nature, the other His divine nature. The baptismal font on the left or south side of the chancel symbolizes entrance into the Christian church. Topping the baptistery is a descending dove, symbol of the Holy Spirit. The raised pulpit on the right side represents the importance of preaching in Protestant worship. A large King James Version of the Bible rests on the pulpit, reminding us of the Reformation. On the main floor at the entrance to the chancel, a peace candle on a stand is a reminder of the presence of God. Banners depicting nine statements of beliefs from the Presbyterian Book of Confessions are displayed on the walls of the nave, surrounding the people as they worship.